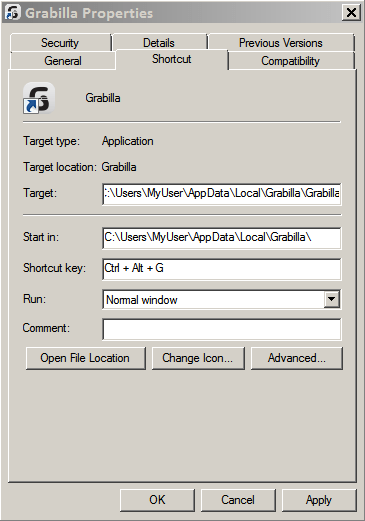 Grabilla manual and how-to take a screenshot. First let me show you simple yet powerful interface of Grabilla. Zoomed overview of area around mouse pointer. It`s needed for accurate selection of screen. Full desktop capture button. Press it to take a screenshot of your entire screen. You can click it with Alt button on keyboard to open screenshot locally. Active window capture button. It captures your active application screen. You can click it with Alt button on keyboard to open screenshot locally. Settings. It will open configuration screen. Video mode. Check the checkbox to record a video after selection. You can select an area of screen or entire screen to record. Usage of Grabilla is pretty simple. Launch it. You will see an interface like on picture above. Select area to capture. 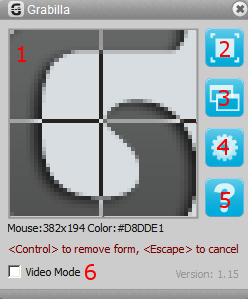 Press left mouse button, drag to select an area and release button. Your default browser will open with a screenshot uploaded to our server. Now let me share some usage tips. How to pin a shortcut to taskbar in Windows 7. Just locate shortcut of Grabilla in Start menu and drag it to taskbar. You can add a Keyboard Shortcut Key to Grabilla to launch it from keyboard. Find a shortcut in your Windows 7 Start menu. You may need to click on All Programs at bottom. Press right mouse button on shortcut and select Properties. Usually bottom item in drop-down menu. Click on a field named Shortcut Key and press G on keyboard (do not press Alt or Ctrl). Of course you can choose any other key that you find more suitable. You should see something like on picture. Press OK to close the window and apply settings. Now you can launch Grabilla by simply pressing Alt+Ctrl+G on your keyboard. Of course if you choose another key on step 3 you had to press this key (with Alt and Ctrl) instead of G.
Do you plan to add new functonnality as recording sounds ? We are looking into this, but can”t tell when it will be ready. I””ve talk with developer and he says Grabilla already can record sound from your mic. Give it a try. Hello, theren will be a way to know/access locally the folder of the taken videos? Thank you. After you stop recording a video you have an options to save it locally or upload to server. You can choose a folder where you want to save it. Please provide more information about this feature. Where to show this color? We have implemented this in 1.15 version. Software was workign great, but now when I click on the Grabilla icon on the desktop or from the start menu my screen goes to white with the Grabilla interface (box with cross hairs). What should I do? Hello, thanks for report. could you please send us what Windows version do you have? After recording 7 videos, the software could not register audio anymore. What could happen it? Hello, thanks for report. Could you please send us info on Windows version you have? Worthwhile data. Blessed myself I stumbled upon your website accidentally, exactly what amazed the reason why that collision don’t came to exist ahead of time! I personally saved as a favorite that. Quisiera grabar un video que tiene audio. Cuando lo veo me doy cuenta que que el sonido no se grabó. existe solución. Por favor, compruebe que ha Sound casilla habilitada comprobado cuando se inicia una grabación de vídeo. This software was working quite good. But, can I find or access locally the folder of the taken videos? Take a look – How to find local screenshot history.